Product information "Kosmos Universal Atlas"
This world atlas offers in-depth geographic information for all the family. Easy comparison of continents and countries is achieved through uniform scales of 1:30 million and 1:4.5 million. Sharp contours and clearly depicted relief enhance the quality of these modern easy-to-read maps, accompanied by an extensive index with more than 76,000 entries. 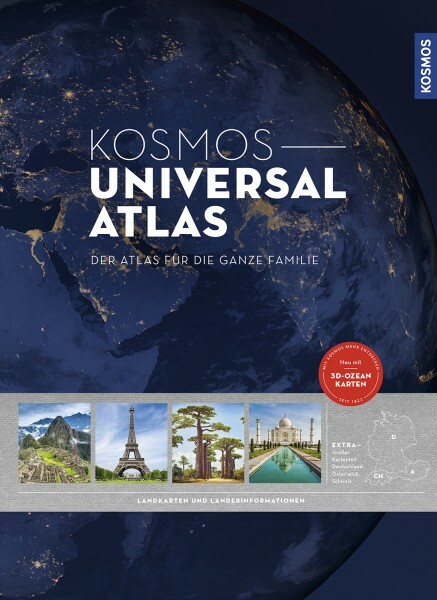 Rounding of the atlas are key statistics for all countries, and as an option:national parts are available for several countries in scale of 1:750,000. Languages available: Arabic, Bulgarian, Chinese simpl., Croatian, Czech, Dutch, English, French, German, Hindi, Hungarian, Japanese, Macedonian, Mongolian, Norwegian, Polish, Portuguese, Russian, Serbian, Slovakian, Slovenian, Spanish. National parts available:	Austria, Benelux, Czech Republic, France, Germany, Ireland, Mongolia, Portugal, Spain, Switzerland, United Kingdom.